Having recently returned from a trip to Paris, I'm forgoing our chosen Pens topic in favor of sharing some thoughts about France. I first visited France as a child. I was fascinated by the architectural art. 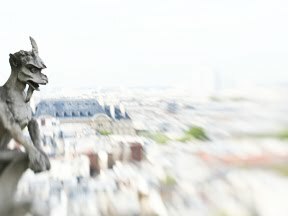 There's something about those enigmatic stone gargoyles watching over the city of Paris that inspires the imagination. Maybe that's why for most of my childhood I wanted to be an architect, and I wrote my first mystery stories in elementary school. Paris has never let me down when it comes to mystery. While backpacking through Europe after college, the day I visited the Louvre, thieves stole a Corot painting from the museum. They cut the painting from its frame with a razor blade. If you've ever been to the Louvre, you know it's huge. This small Corot painting was in an unguarded room. When the museum guards realized it was gone, they shut the museum -- trapping thousands of us inside. What stood out to me most that day was the fact that they didn't search each and every one of us. They were going to have a riot on their hands with the huge number of tourists trapped inside, many of whom had flights to catch. I was on the mezzanine level, underneath the glass pyramid and above the ground floor lobby, so I could see people from the lobby making their way up the spiral staircase and being searched. After a few hours, we were released. The painting was never found. 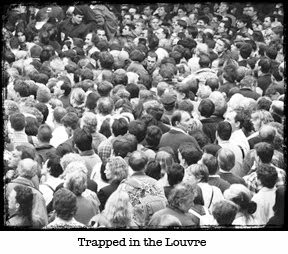 Another interesting fact from that day at the Louvre was that a friend who I had yet to meet was also trapped in the museum that day. When we later met, we found her in one of my crowd photographs from that afternoon. My latest trip to Paris started off in a more mellow fashion. It was inspiring for its simple pleasures. We enjoyed the good life taking long walks along market streets and eating leisurely meals while drinking carafes of wine at sidewalk cafes. Over one such laid-back meal, my better half turned to me and said, "Why isn't life like this at home?" It was a good question. It was a simple meal at a casual cafe, but there was something special about it. Not just that we had traveled to Europe to get it. Carafes of both water and wine sat on the table. The salad was dressed simply with good olive old and vinegar. The baguette was fresh from the oven. The waiter didn't rush any of the patrons (although he did switch to English after hearing my horribly accented French, thereby not letting me practice); in fact, it was damn near impossible to get the bill at the end of any meal. I resolved to take some of that je-ne-sais-quoi home with me. A meal doesn't need to be complicated to be exquisite, but we needed to slow down to enjoy it. ... and stopped by the scene of that old theft. It might have ended up a relaxing if somewhat uneventful trip, had it not been for the ash cloud. The plan was to take the Eurostar train across the chunnel to England to spend a weekend in London before flying home. The first part of the plan worked perfectly. Unfortunately, our airline hadn't managed to work out their schedule of planes due to the new routing based on the approaching ash cloud. After a day's delay, we departed, only to find it took 42 hours in transit to get back to San Francisco. Now that I'm home and well-rested, I'm ready for my next adventure. I think I'll go pick a salad from the garden and get back to work on that mystery novel. Love this! Thanks! How interesting to be shut up in the Louvre, and finding your friend in one of your photos is so cool. I wonder where that Corot is now. Definitely a tantalizing tale. I'd been dying to hear at least a little about your trip. Your photos are great. Your books sound spectacular. I can't wait to read them. Man, you could never have a coincidence like that in fiction -- no one would believe it! Can't wait to read your mystery, Gigi! It sound fantabulous! 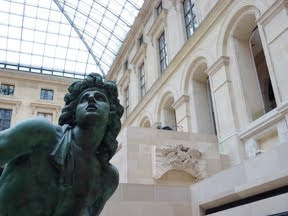 I was so excited to go to the Louvre lo these many years ago. To see paintings and sculptures that I drooled over only in books and then to see them in person was such a splendid treat. And I absolutely fell in love with the Canova sculpture of Cupid and Psyche. I had seen it many times before in books but standing in front of it was a completely different experience. It glowed. It was amazingly smooth and luminous. The gentle arc of limbs and the concentration of their eyes. I stood in front of it for at least an hour, mesmerized. I never had that experience before but I have since. Art will do that. What a wonderfully weird story. I'm writing a mystery set in Paris of 1897, and currently reading The Crimes of Paris, which centers around the theft of the Mona Lisa, but has other surrounding crimes. Very entertaining. 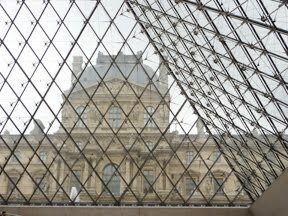 The Louvre drives me insane. I get lost! I'll have to start with your SF mystery, since I live nearby. I hope you do the Paris setting. Can I follow you around? I promise to take you scuba diving with me and show you each and every colorful fish and tell you their names, if you'll tell me stories of art thefts and feed me in Parisian cafes. Jeri -- So true! I had a backpack day bag with me at the museum that could easily have fit a rolled-up painting. I was so shocked at the time that they didn't search it. LGC, Mysti, and Gayle -- The idea (so far) with my Jaya Jones mysteries is that they're set in Jaya's home turf of San Francisco, but a historic art mystery takes her from SF to a foreign destination. ARTIFACT goes from San Francisco to London to the highlands of Scotland and involves a historic mystery from the days of the British East India Company. PIRATE goes from San Francisco to south India and involves a mystery from the days of the San Francisco Barbary Coast. Barbara -- I counted my blessings that at least 8 of those hours in transit were in a little hotel room in Atlanta. But I think it'll be a while before we go on another transatlantic flight! I love this story! Getting trapped in the Louvre sounds like the beginning of a novel, doesn't it? I can NOT wait to see your Jaya adventures in print!!! Oh, that fresh baguette.... Nothing like it. 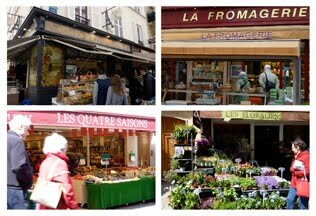 Paris...*sigh*...fresh bread and chocolat, salad nicoise, pomme frites, the Louvre, croque madames, Notre Dame, I am soooo jealous. :) I was lucky enough to see Monet's Impression at Sunrise a few months before it was stolen. 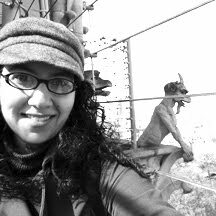 What a great idea to have Jaya in a cool city, and then she goes to other very cool places. Sounds like my kinda books! Juliet and Mary -- I'm workin' on it, so hopefully it won't be TOO much longer!